Garlic is generally considered a healthy herb, but high doses may result in diarrhea, according to NYU Langone Medical Center. 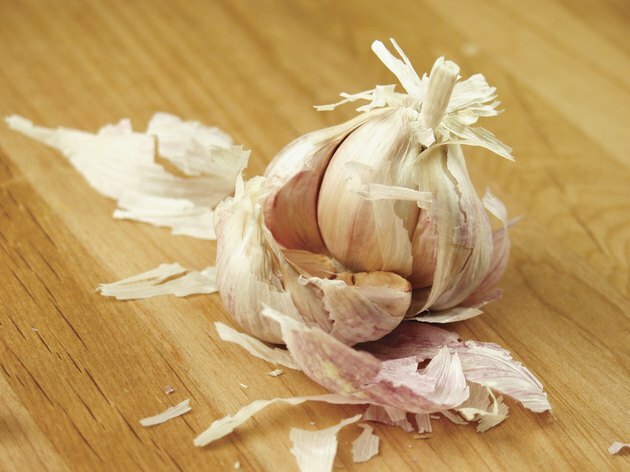 Too much garlic can also cause other digestive woes such as gas, heartburn and upset stomach. The most common causes of diarrhea are viral, bacterial and parasitic infections, reports MedlinePlus -- and because garlic has antimicrobial properties, it could help fight diarrhea from these causes. However, more research is necessary to prove this possible benefit. Stick with moderate portions to help prevent garlic-related diarrhea. The University of Maryland Medical Center reports that typical safe intake falls around 2 to 4 grams of fresh garlic per day -- each clove is about 1 gram. In these amounts, UMMC says that garlic may help ward off heart disease, colds and cancer, although studies are still limited. Garlic also comes concentrated in supplements, and normal doses range from 600 to 1,200 milligrams, spread out in smaller portions over the course of a day. Speak to your doctor before taking garlic supplements, or if you experience persistent diarrhea.